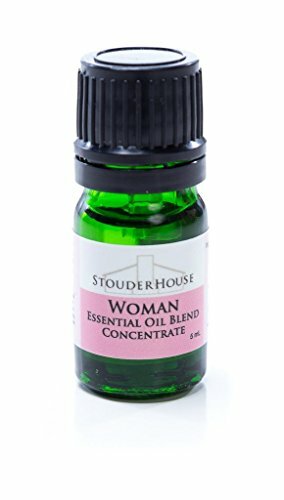 A StouderHouse blend of undiluted 100% pure therapeutic grade essential oils to provide a balancing influence to women's health. For use in diffusers, humidifiers, bath water, etc. Dilute before using directly on skin. Contains a StouderHouse exclusive blend of sandalwood, marjoram, clary sage, lavender, jasmine, rose, cypress, chamomile, geranium, and neroli essential oils. Caution: Possible skin sensitivity. For aromatic or topical use only. Keep out of the reach of children. If pregnant or under a doctor's care, seek the advice of a physician. If irritation occurs, discontinue use. This product has not been evaluated by the Food and Drug Administration and is not intended to diagnose, treat, cure, or prevent any disease. Please note: Orders containing undiluted essential oils will ship USPS Retail Ground and are expected to arrive at the destination 2-8 days after shipping. If you have any questions about this product by StouderHouse, contact us by completing and submitting the form below. If you are looking for a specif part number, please include it with your message. Rose Garden Perfume Solid, Perfume Rub, Perfume Balm, Aromatherapy, Essential Oils, Rose Lover, Floral Scent, Sandalwood, Rose Scent, 1 oz. Deep Patchouli Perfume Solid, Perfume Balm, Perfume Rub, Aromatherapy, Essential Oils, Patchouli Lover, Travel Perfume, 1 oz.